GEN Andrew Jackson Goodpaster, Jr.
Andrew Jackson Goodpaster, Jr. was born on 12 February 1915 in Granite City, IL. His U.S. Army career began when he entered the U.S. Military Academy in 1935. Upon his graduation with the Class of 1939 (second in a class of 456), he was commissioned as a Second Lieutenant in the Corps of Engineers. After serving in Panama, he returned to the U.S. in mid-1942 and, in 1943, attended a wartime course at the Command and General Staff School, Fort Leavenworth, KS. During the Second World War, he commanded the 48th Engineer Combat Battalion in North Africa and Italy. He was awarded the Distinguished Service Cross, the Silver Star, and two Purple Hearts for his service in World War II. His combat experience was cut short in January 1944 when he was severely wounded and sent back to the U.S. to recover. After his wounds healed, he was assigned to the War Planning Office under General George C. Marshall, where he served for the duration of the war. General Goodpaster was seen by many as the quintessential "soldier-scholar. "At Princeton University he earned an M.S. in Engineering and an M.A. in 1949 and then earned a Ph.D. in International Affairs, also from Princeton, in 1950. • Commander-in-Chief of USEUCOM and Supreme Allied Commander of NATO Forces (1969-74). After retiring in 1974, he served as Senior Fellow at the Woodrow Wilson International Center for Scholars and taught at The Citadel. His book, For the Common Defense was published in 1978. He was brought back to active duty as the 51st Superintendent of the U.S. Military Academy (1977-81) after a notorious cheating scandal in 1976. Although he had retired with the rank of General (four stars), he served as Superintendent with the rank of Lieutenant General (three stars), since the Superintendent billet carries that rank. 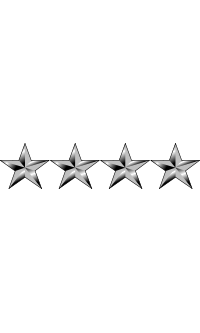 In 1981, when Goodpaster retired for the second time, he reverted to four-star rank. In his later years, Goodpaster was vocal in advocating the reduction of nuclear weapons. In September 1994, he commented, "Increasingly, nuclear weapons are seen to constitute a nuisance and a danger rather than a benefit or a source of strength." 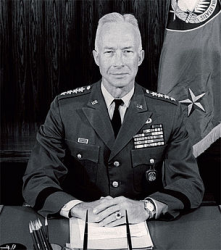 In 1996, along with General Lee Butler and Rear Admiral Eugene Carroll, Goodpaster co-authored a statement for the Global Security Institute advocating the complete elimination of nuclear weapons due to their danger and lack of military utility. Lieutenant Colonel (Corps of Engineers) Andrew Jackson Goodpaster, Jr. (ASN: 0-21739), United States Army, was awarded the Distinguished Service Cross for extraordinary heroism in connection with military operations against an armed enemy while serving as Commanding Officer, 48th Engineer Combat Battalion, in action against enemy forces on 29 January 1944. Lieutenant Colonel Goodpaster's intrepid actions, personal bravery and zealous devotion to duty exemplify the highest traditions of the military forces of the United States and reflect great credit upon himself, his unit, and the United States Army. • At General Goodpaster's first retirement in 1974, President Gerald Ford awarded him the Defense Distinguished Service Medal. • In 1984, President Ronald Reagan awarded Goodpaster the Presidential Medal of Freedom "for his contributions in the field of international affairs." This was the first and only award of this medal to Goodpaster. • In 1992, he received the U.S. Military Academy Association of Graduates' Distinguished Graduate Award. • Goodpaster, Andrew J. Strengthening Conventional Deterrence in Europe: A Program for the 1980s. Westview Special Studies in International Security (ISBN 0813370787). Boulder, Colorado: Westview Press, 1985. • Goodpaster, Andrew J. and Elliot, Lloyd. Toward a Consensus on Military Service - Report of the Atlantic Council's Working Group on Military Service. Tarrytown, New York: Pergamon Press, 1982. • Goodpaster, General Andrew J. SHAPE and Allied Command Europe In the Service of Peace and Security. 1973. General Andrew Jackson Goodpaster died on 16 May 2005. He is buried at Arlington National Cemetery in Arlington, VA, in Section 1, Lot 149-B.